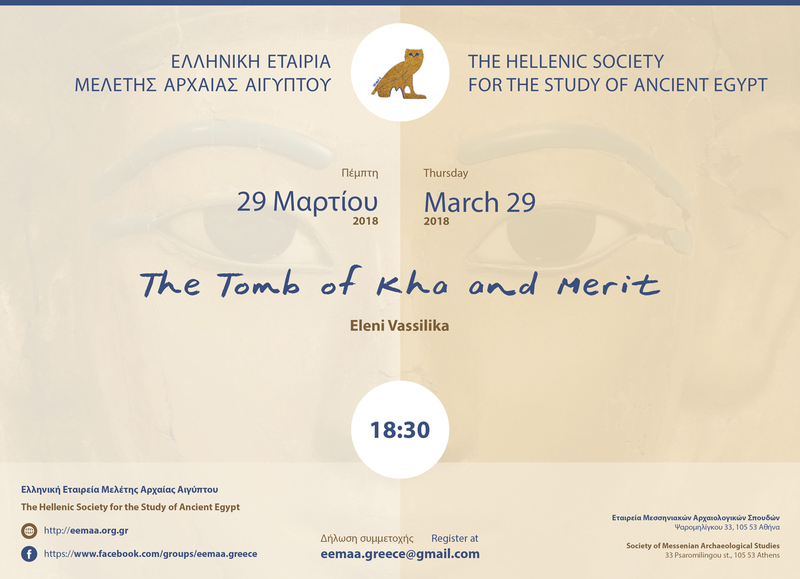 Eleni Vassilika will address the topic “The Tomb of Kha and Merit”. The lecture is organized by the Hellenic Society for the Study of Ancient Egypt. The tomb of Kha is the best furnished, non royal tomb from ancient Egypt. As overseer for the construction of the royal tombs, Kha’s professional career spanned the reigns of Kings Amenhotep II, Tuthmosis IV and Amenhotep III. Kha oversaw the workmen, who carved out and decorated these royal tombs. It is probable that he too was an able hand at land surveying and marking out, judging from the well worn tools found among his personal belongings. Having begun the preparations for his tomb in life, Kha arranged to have his coffins built and decorated. Suddenly, he was pre-deceased by his petite young wife Merit, and so some objects were hastily employed for her. Later the tomb would be filled, even stacked high with furnishing labelled for him. When he opened the door to the intact tomb in 1906, the excavator Ernesto Schiaparelli found the crowded inner chamber with two great coffins (with stunning ones nested within) covered by ancient dust sheets. The furniture included tables, stools, a chair, two beds with bedding, numerous chests blazing with colourful decoration and filled with linen and salves. Vessels of every description, foodstuffs, stacks of breads in a variety of shapes and dried plants etc, were still intact on the tables. Intended to serve Kha and his wife Merit in the Afterlife, almost the entire tomb contents (amounting to a total of over 500 items) are now housed in the Egyptian Museum in Turin. Dr Eleni Vassilika is a specialist in ancient art. She was Keeper of Antiquities at the Fitzwilliam Museum of the University of Cambridge (1990-2000), before taking up the Directorship of the Roemer-und Pelizaeus-Museum in Hildesheim Germany (2000-2005) and then moving on to the Directorship of the Museo Egizio in Turin Italy (2005-2014). Eleni returned to the UK as Curatorial Director of the National Trust, responsible for all historic properties in England, Wales and Northern Ireland. She now devotes her time to writing and organizing exhibitions for Japan.